Are you looking for fingerstyle guitar lessons? Are you able to play finger-style guitar to the level you want? Do you find it difficult to learn your favourite fingerstyle songs on guitar ? Do you want to write your own finger-style guitar arrangements for your favourite songs but don’t know how to do it? Perhaps you are still new to the guitar or new to finger-style but don’t know where to start? Do you know how to play finger-style guitar but want to develop your technique and reach higher levels of playing? Experience The Greatest Fingerstyle Guitar Lessons. Ever. Finger-style or ‘solo’ guitar playing is something that many guitar players would love to do and often look in awe at great finger style players. Being able to play a whole ‘complete’ song on one guitar – playing melody and harmony at the same time! Many guitar players shy away from even attempting to play finger-style because they fear that it is too complex and complicated to learn. They just think that it is way beyond their capabilities, or that it would take far too much time and effort. Many guitarists are afraid that it would force them to learn music theory first or learn classical guitar, and likely waste time with learning things they don’t even want or need to learn. Finger style Guitar teachers often tell their students that they can’t learn to play finger-style guitar unless they can read music. This forces people to check out free fingerstyle guitar lessons on the internet, which are often misleading, incomplete or conflicting with other resources. Too many guitar players just play using tab note-for-note without having a clue about what they are doing. They are just ‘slaves’ to guitar tab, and think that the only method of learning fingerstyle guitar involves a painful process. These guitar players usually feel frustrated that they do not understand how to use their techniques and skills effectively to create their own song arrangement or composition. What if there was a way to learn to play finger-style without needing music notation or requiring you to learn tons of classical songs that you may or may not even know? What if you could learn to easily learn to play your favourite finger-style songs on the guitar, and even learn how to arrange songs for ‘solo’ guitar playing? There is a BIG difference between just reading and playing some guitar tab off the internet and actually being able to make your own arrangement for finger-style songs. Understanding exactly what to do, how to do it, and why you can do it separates the amateurs from the pros. In Fingerstyle Revolution you will EASILY learn to play finger-style guitar without stumbling over your fingers and without fussing over music notation. This program will take you from the basics and fundamentals of finger-style all the way to more advanced finger-style playing. You will learn the fundamental finger-picking patterns and how to adapt each finger-picking pattern to different songs. You will learn to visualise guitar tab for finger-style in a very easy way. If you have tried using guitar tabs when learning to play your favourite songs and arrangements you know exactly what I’m talking about. Sometimes its just so confusing to read those things! You will learn different types of finger picking techniques in different genres such as Blues, Flamenco, Country, Pop, and even Percussive guitar! You will learn how to arrange songs for finger style so that you can make your own cover versions of songs. For Beginners and up. Join the Revolution. I started fingerstyle revolution with Vishaal about 6 months ago. I have gained a better understanding of listening to songs from an overall perspective where rhythm, bass and melody is integrated as one and correlates to form a song. I have been able to appreciate music at a higher level by focusing on not only the lead melody when listening to songs but also the rhythm and bass accompaniment of a song. Though I am still attempting to arrange my own fingerstyle version of my favourite songs, all the tips and process of doing this itself in my opinion has helped me improve further as a guitar player. 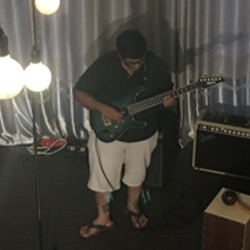 Before fingerstyle revolution with Vishaal, my rhythm guitar playing was more of strumming and stuff, but now I am able to play different fingerstyle picking patterns and even flamenco style as rhythm or backing track to which I can then improvise lead melodies too. It has opened up a wider range of creative usage of the musical knowledge I have learnt from Vishaal prior to starting Fingerstyle Revolution. I would have to say that I have improved by over 50 to 70% as a guitar player now after starting Fingerstyle Revolution with Vishaal as compared to before. I would recommend Fingerstyle Revolution lessons to anyone who just likes music and wants to be able to play songs as a whole. I enjoy Fingerstyle Revolution with Vishaal very much. We are always exploring different ways to arrange and be creative with the fingerstyle arrangements in the class. I enjoy the process of being creative and trying to have personal influence in the fingerstyle arrangements. After taking the Fingerstyle Revolution, I am able to play different fingerstyle patterns and flamenco style on guitar. I also know the process of trying to arrange a fingerstyle piece and am able to visualise the chords to be used when I see a fingerstyle arrangement tab.